The first two Infamous games—both personal favorites of mine—stand as high points in Sony's first-party publishing portfolio: wonderfully crafted superhero playgrounds infused with a great sense of flow and urgency. Both of Cole McGrath's adventures held inspirations and commentary drawn from the real world but those elements lay nestled a few layers under the surface of story and gameplay. The allusions to 9/11, Hurricane Katrina and other large-scale tragedies played sidekick to the good/evil dichotomy and power acquisitions. They added depth but weren't the main attraction. Spoilers follow for the ending of Infamous 2. That was okay, though, because the mechanics of the Infamous games turned them into inadvertent metaphors about the relationship between individuals and cityspaces. In Infamous 1 & 2, you felt like you were resurrecting entire cities, either by making the lame walk with a healing touch or by traveling into a broken electrical grid and setting it afire again. Cities don't work unless we treat each other well. But they also don't work unless we sometimes treat each other like crap, too. This is the thematic lynchpin that the Infamous games have revolved around. The good or ill will with which people treated each other became another resource you could tap into, earning different powers and plot twists as a result of however altruistic or Machiavellian you chose to be. And because Empire City and New Marais were fictional homages to New York City and New Orleans, Sucker Punch could make them as fractured or bluesy as they wanted. But this new Infamous happens in Seattle, an actual metropolis that living, breathing folks can visit or live in. This isn't a place that's just inspired by Seattle; it is Seattle. Sucker Punch has talked up its ambition to touch on what it means to live in the modern-day surveillance state and the Seattle in Second Son reflects the post-PRISM landscape where the government's watching citizens even if they've done nothing wrong. Surveillance cameras sit on walls all across the city, checkpoints control who gets to go where, and no phone call goes untraced. This is the part that worried me. Trying to recreate the moral grey areas of real world events has tripped up many a genre fiction storyteller, especially in video games. Intent or sincerity don't matter. Do that stuff wrong and it will overpower every good part of a game. Thankfully, that doesn't happen in Second Son. Yes, the shift to Seattle brings an increased embrace of metaphor and symbolism, all in a place memorialized by political protests. It's the kind of thing that can make game developers stumble and faceplant. And while that embrace does feel awkward and forced at times, it manages to stay on just the right side of creative execution, mostly because emotional and mechanical elements of Second Son foster so much goodwill. Delsin Rowe's mission feels personal right from the start. The new lead character is using his just-discovered powers to become superhuman enough to save the lives of loved ones back in a fictional Native American community. He gets pulled into metahuman drama after a brutal attack by a government-sponsored Conduit (Infamous' term for metahumans) injures people in his tribe, during efforts to try and round up escaped super-prisoners. His cop brother Reggie wrangles him on the trip to Seattle and once there, the testy relationship between he and Delsin is one of the better things about the game. The funny banter and aggressive disagreements make them feel like real siblings. Delsin enjoys being a superhero and Troy Baker's performance of him goes a long way towards making him likable in moments where he should be annoying. Second Son starts seven years after the end of Infamous 2. Conduits still exist but they're classified as bio-terrorists by the government and rounded up in special prisons where their rights—and sometimes their lives—cease to exist. Early on, there's a moment where non-powered people on a bus Delsin saves from disaster say that they want him to ride on top of the bus instead of inside. A ham-fisted Rosa Parks reference is made but that sequence of dialogue is still affecting. The escapees on another transport were headed to one such lock-up and it's one of them that gives Delsin his first set of powers. See, Delsin's a power absorber like the X-Men's Rogue, with the ability to replicate the talents of other Conduits. As a matter of fact, the franchise's debt to the X-Men concept is bigger than ever. Augustine—Second Son's big bad—is herself a Conduit who corrals, cages and experiments on other "bio-terrorists." She reminds me of Mr. Sinister while the other, maladjusted Conduits Delsin meets and mimics powers from could be alt versions of New Mutants or Generation X characters. He winds up getting four different powersets throughout the game and that multiplicity is just the beginning of Second Son's successful upscaling of the series' formula. Smoke is the first attribute Delsin wields in the game, letting him blast fiery projectile attacks, instantly shoot to the tops of buildings as a smouldering cloud and send groups of thugs into paralyzing coughing fits. Then you get Neon, a glowing complement of superspeed abilities that lets you do slo-mo sniping and run up walls, among other things. The trademark sense of flow comes back with Second Son: you can zip to the top of a building as smoke, glide to another rooftop, lob volleys at enemies, dash out of their line of fire and smash down with an area attack in a matter of seconds. But the great thing about getting new powers is how it reveals a new set of opportunities across the city. When you start off with Smoke, the neon signs you float by look just like pretty decorations and signage. But after you get the Neon powers, those become places to recharge or change up strategy. What's even better here is that the flow continues and feels differentiated as Delsin acquires new powers. If you're using Neon and absorb Smoke from a wrecked car, you switch to the other powerset. That ability to toggle multiplies the possibilities of flow in really clever fashion. Maybe you're taking on a few dozen Department of Unified Protection agents in one of their strongholds, starting off the combat with smoke attacks. But a pesky sniper keeps nailing you wherever you go. You can find a Neon node, absorb it and slow down time to put a laser right between his eye. Or absorb the element which lets you generate decoy or minion characters to fool attackers or draw fire. A little Smoke here, a little Neon here, some of Power X in this corner and eventually the entire city winds up feeling like a palette you can use. Verticality plays a huge role in Second Son's overall design and combat throughout all of this. The DUP grunts have the advantage of AI aiming and numbers, but you can run up a building and pick 'em off from on high. Or plummet down with a massive ground pound and scatter their ranks. Seattle is more subdued than Empire City or New Marais, no gangs of mutated creatures or marauding ice-wielders here. I have no way of doing a headcount but this game's city feels emptier than previous two Infamous games. That's not a bad thing, though. A more sparse pedestrian population works in an odd, counterintuitive way here, making Seattle feel more "real." A stunning amount of graphical detail whizzes by as you vault through Second Son's Queen City. The gameworld feels richly and variably textured, mixing up sleek high-rises, wooded areas and burnt-out concrete towers under an impressive array of lighting. Best of all, most of that dazzle has gameplay connections. The neon undercarriage details on the cars scooting along? They're not just graphical muscle-flexing, you can drain them for more superspeed laser powers. Karmic super-attacks get variants based on the urban elemental powersets, too, but essentially still do the same thing: destroying every human-scale enemy in a very large radius. The DualShock 4 touchpad gets used for some environmental interactions: press down to drain power sources, swipe left to open cages or down to destroy auto-turrets. And to perform the grafitti side missions—where you imprint Banksy-style rebellion/civil disobedience stencil art all over the city—you'll use gesture controls to shake up a can of spray paint. This tagging is a cute but annoying idea that you have to do to completely liberate Seattle's oppressed districts. Other side missions in Second Son have you doing things like looking for hidden surveillance cameras, taking down drug dealers and searching out audio logs. Second Son doesn't just do shinier versions of the things previous Infamous games did. It multiplies and extrapolates on those things, letting them intertwine in really satisfying ways. So you get some skills that have choice built in, like sniping that lets you automatically go for headshots (evil) or hobbling (good.) You're a hero—or anti-hero, if you so choose—who can change the nature of his super-ness on the fly. 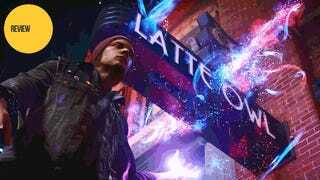 There's a brief sequence in the last third of Second Son where Delsin's powers glitch out. You're forced to run past folks getting beaten up and you can't help. It feels pretty horrible, at least if you're playing Delsin as a good guy. That feeling is testament to how much the game pulls you in. Second Son feels like a game made by a studio reaching the peak of its own powers, on a new console that it's helping come into its own.